Previously we talked about the possibility of EHOME’s coach and manager, 71, returning to the esports scene after a long hiatus. 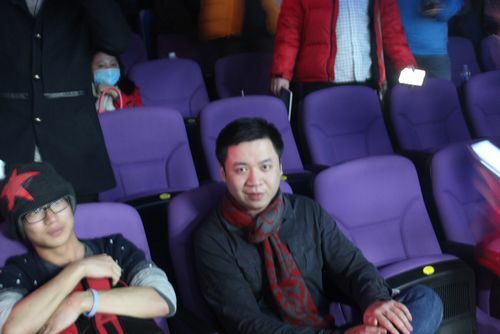 71 himself had said before that LaNm, BurNIng, and MMY are amongst his biggest prides in his esports management and coaching career, while LaNm and BurNIng have also publicly reciprocated, listing 71 as the most important person in their careers. Indeed, with these players as core members of his EHOME teams of old, 71 has long since established himself as a legendary contributor. Recently, DK won the Fengyun Hegemony Cup, a mid-tier event, and just last night, they won their first large Dota 2 event, the million-RMB 2013 WPC-ACE League. At the WPC-ACE League Finals, 71 was present and once again had an impact. His players thanked him and on multiple occasions outlined his influence in helping them turn things around, with LaNm noting that 71 had been with them and helping them since they returned late last year after MLG. He was also the one in this gif, first celebrating outside the glass, then rushing into the room to celebrate with his players. 71’s joining seems to have been that final push that DK needed to break their long-standing streaks, and the ingredients are certainly there for 2014 to be the year of DK… just as 2010 was the year of EHOME. In the .gif posten, what does the number in the bottom of the screen mean? They ran throughtout the seriers and kept growing for each side. Cool, thanks! I thought it might be who people would think would win, which would then indicate how many people were watching the games, but that is not the case then. Do you have any idea/educated guess as to how many saw the games in China? I believe the main Chinese stream plus whatever other minor streams for the event peaked somewhere around 150-200k concurrent total. It’s such a large range because I wasn’t paying very close attention to viewer numbers, but I think that’s in the ballpark.